Simplify your beauty routine and say goodbye to mascara! 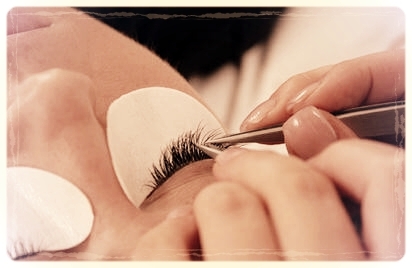 Eyelash extensions enhance the length, curl, thickness, and fullness of your eyelashes. Each set is completely customized to the guest’s preferred look. A synthetic mink lash extension is applied one by one onto each individual natural lash. Lashes can last up to 4 weeks, depending on each person’s. Fills are recommended every 2 to 4 weeks. Please call with any questions you may have regarding lash shedding or aftercare. For those who want a soft, natural look. 50%-60% of your lashes are enhanced. If you decide you'd like to upgrade to the Signature or Glam Lashes, that can be done at your next fill. Please let us know so we can schedule accordingly. The results of the Signature Lash Extensions are a darker lash line and a perfect mascara look. This is just right for the girl who wants a full lash look. 70%-80% of your natural lashes are enhanced. If you decide you'd like to upgrade to the Glam Lashes, that can be done at your next fill. Please let us know so we can schedule accordingly. For those who desire a beautifully dramatic look. Extensions are attached to 85%-95% of your natural lashes, giving you the fullest look possible for your eyes. If you have had your eyelash extensions done elsewhere, we are more than happy to do a fill on top of your existing lashes. We will do our best to work with what you already have, but in certain cases you may be asked to have a removal and then start fresh with our lashes. You must have about 50% retention when coming in for just a fill. Recommended if it has been one week since your last appointment. Recommended if it has been two weeks since your last appointment. Recommended if it has been three to four weeks since your last appointment. Microblading is a semi-permanent procedure where pigment is deposited into the first layer of your skin. This procedure typically lasts anywhere from 1 - 2 years, depending on skin type (normal, oily, dry), age (youthful or mature), and aftercare. The pigment is applied with a hand piece and tiny blade that creates hair like strokes, giving it a natural and realistic look. Microblading is open to those with no eyebrow hair, over plucked brows, or those just looking to enhance their natural shape. The initial Microblading session takes about 2 - 2 1/2 hours. During this session, the Microblading specialist will create a shape desired, followed by a pigment selection, then the procedure itself. Microblading requires a non-refundable deposit of $100. Deposit will go towards the price of your service.